Stairs AND an Obstacle Course! 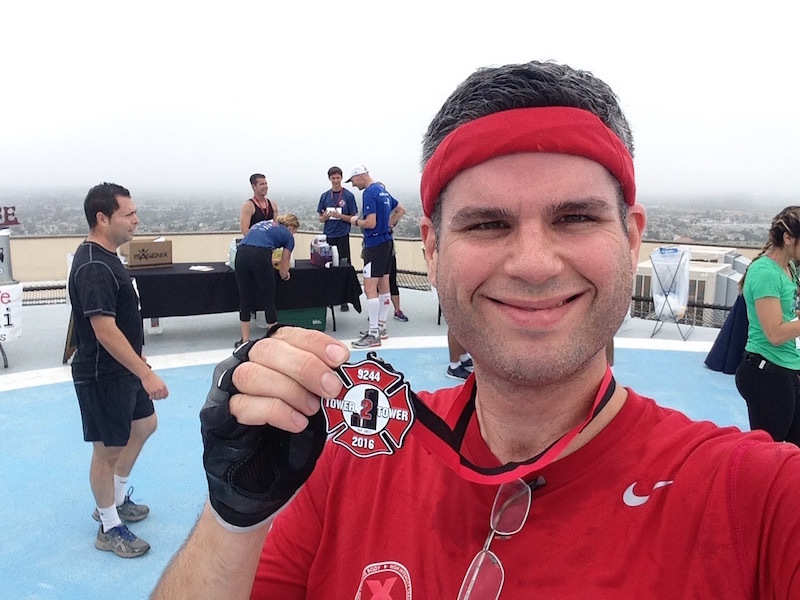 (Tower 2 Tower Race Recap) | Keep It Up, David! 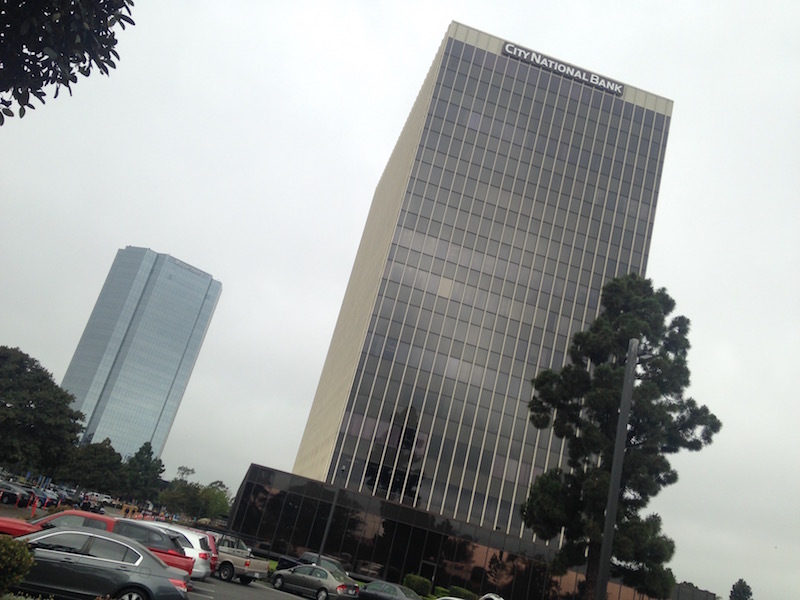 First we raced up 14 stories in this building. Then we ran to a different stairwell, and ran down. Then, we ran about a quarter of a mile across a parking lot, through an obstacle course. Once we got through the obstacles, it was up the stairs in the second building, the 22-story Morgan Stanley Tower, finishing on the roof. I didn’t put too much pressure on myself going into this race. (Something I’m usually really good at doing.) Racing down stairs is something that doesn’t really interest me at all, because it’s much harder on your body, and I had no idea what to expect with the obstacles. There was a great turnout – over 500 people. Like most stair races, they let one person start every 10 seconds. The organizers didn’t separate participants into waves or heats, so there was a really long line to start. I got in line early and ended up about 7th in line, behind a group of very competitive, fast runners, most of whom are friends. Check out this line! That’s my pal Madeleine with her arms up. I don’t know what I was thinking. I suppose I wasn’t thinking at all. It was my turn to start, and when they gave me the go ahead, I just went for it. All out. Giving this stair climb everything I had. I didn’t give a lick of thought to pacing whatsoever. That was dumb. RELATED CONTENT: This wasn’t my only race that weekend. I also did a 5k the next day…while wearing a tutu! Details here. Madeleine entered before me, and I caught up to her by the 8th floor. Madeleine is faster than me, so I knew I must’ve been going gung-ho to close the gap like I did. I trailed her for a couple stories, and them BAM. I conked out. Everything started aching all at once. 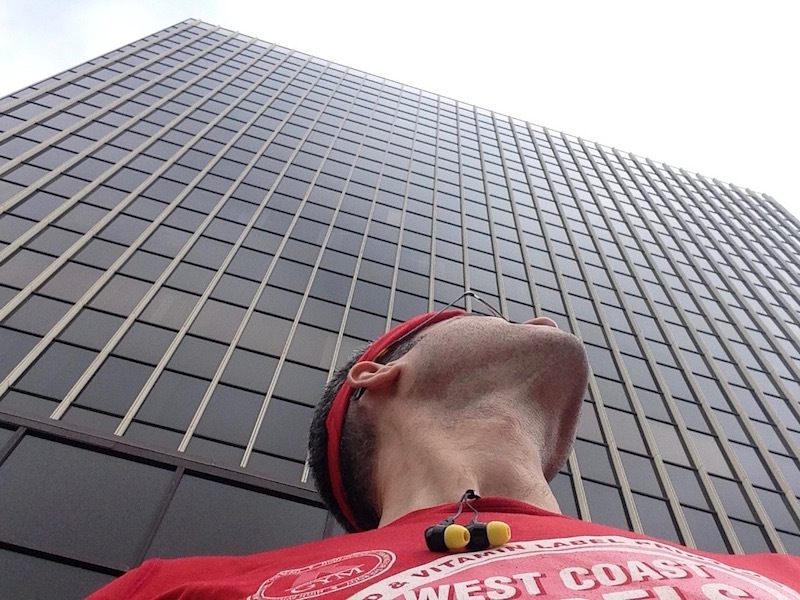 I didn’t stop, but I had to slow way down – I couldn’t keep up that ridiculous sprinting pace. Madeleine regained her lead, and I didn’t see her again for the remainder of the race. I felt ready to collapse when I got to the top floor, but I couldn’t stop. I headed down the hall and started racing down the other stairwell. I had never raced down stairs before, and I had no intention of hurting myself, which seemed not only possible, but imminent if I wasn’t smart about it. I stuck to single steps, with my feet angled to one side or the other (which is better for the knees), and I went at a comfortable pace. I got passed going down, by my friend Z, and that was fine. 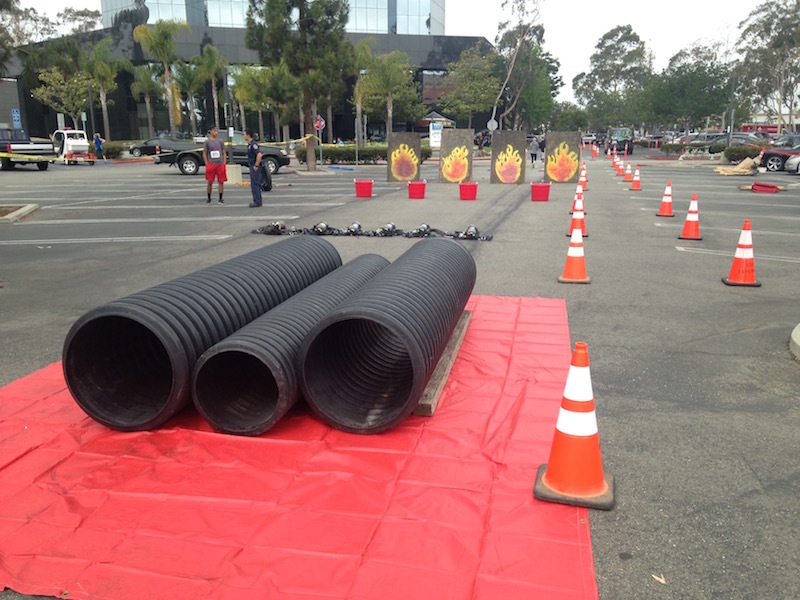 The 14 stories went quickly, and soon enough I was running towards the obstacle course. I had scoped out the obstacles beforehand, and had a good idea for what was to come. 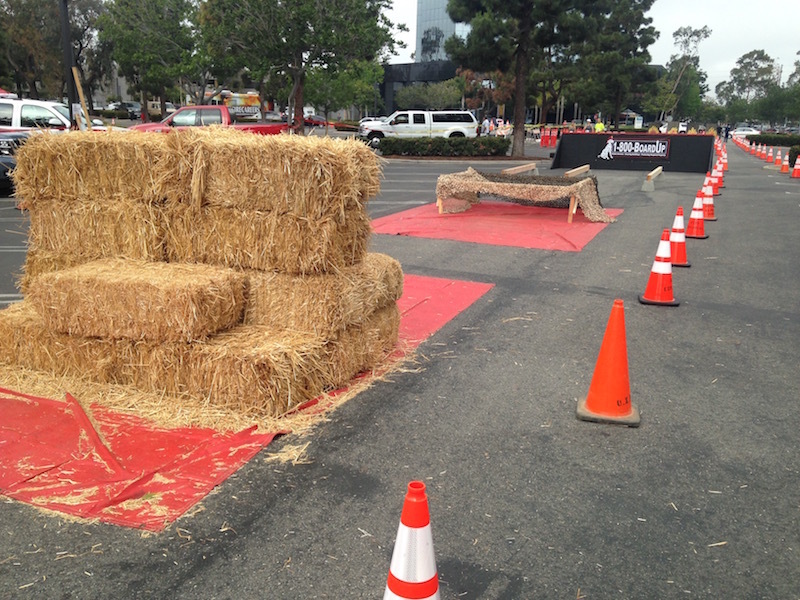 First up were some over and under obstacles: over a pile of hay bales, crawling under a tarp, traversing a balance beam, and over a wall. 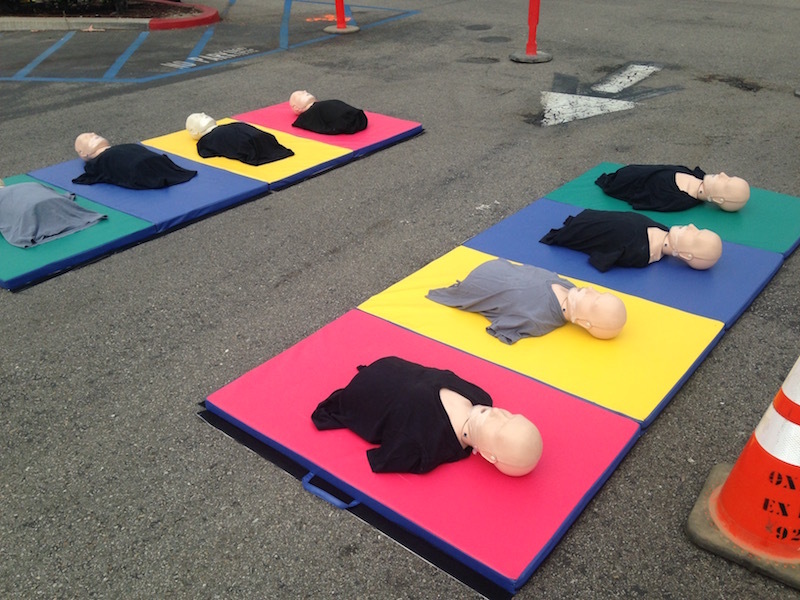 Finally, I had to administer 30 CPR compressions to a resuscitation dummy. No obstacles was that tough on its own, and I liked that there was a lot of variety. Plus, there were volunteers on the side reminding you of what to do. The worst part about it for me was that my iPod wasn’t very secure, and all the under and over stuff made my earbuds come out of my ears and the wires fly everywhere. Next time I’d do this race without music. 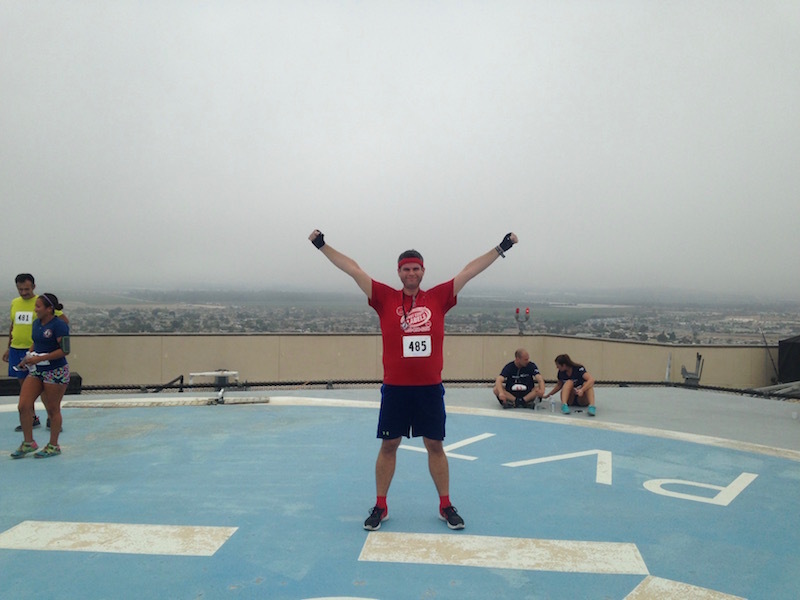 After the obstacles, it was on to the Morgan Stanley tower! 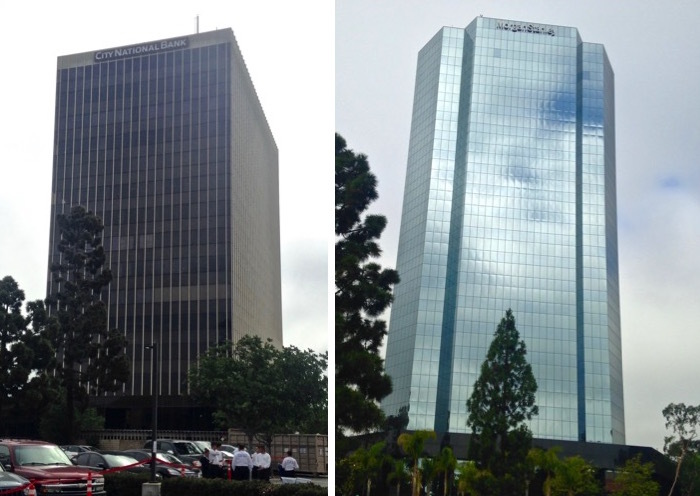 It’s billed as a 22-story building (the tallest in Ventura County), but it seemed taller. And I was exhausted, so I was moving slow. I passed a guy (and was passed by another guy) on the 3rd or 4th floor, and then I didn’t see anyone else the rest of the time. 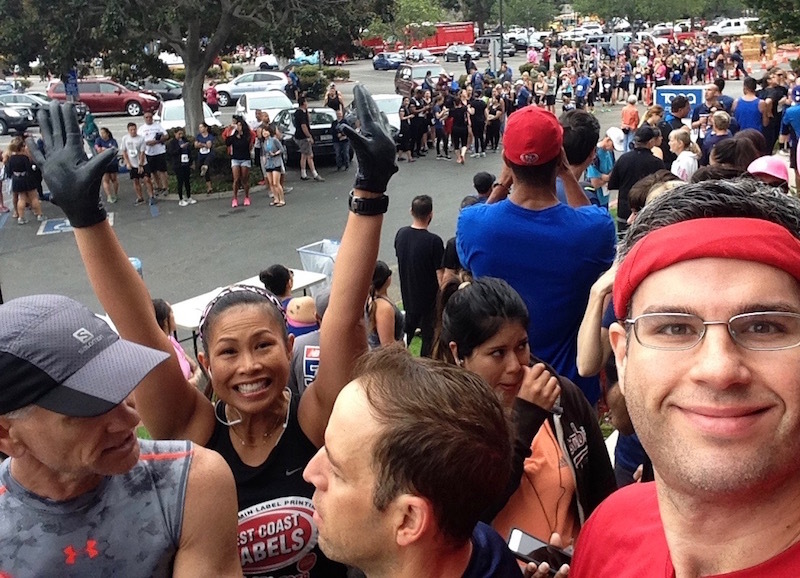 RELATED CONTENT: Check out race recaps from dozens of other stair races! 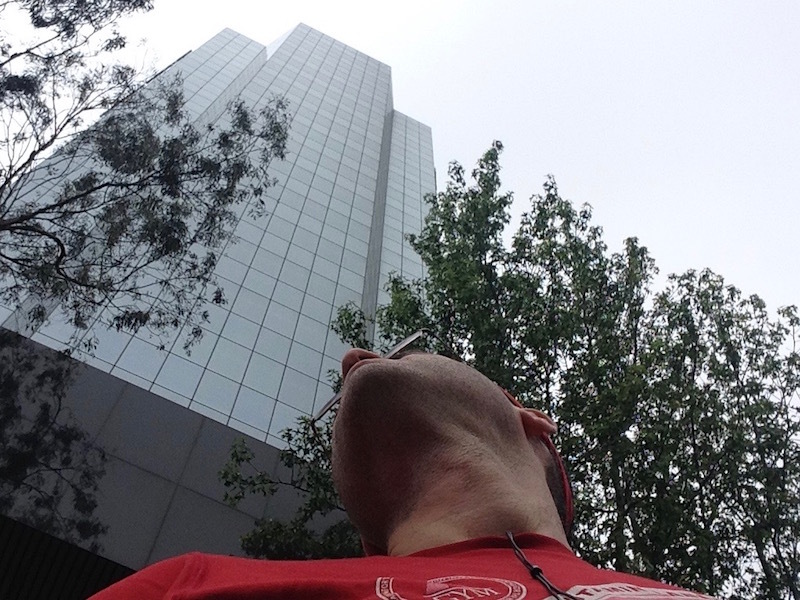 Between the two buildings, there were 36 stories to climb (plus the descent and the obstacles), but by the time I crossed the finish line, it felt like I had finished a building three times as tall. I went to the far corner of the helipad and laid down until my heart settled a bit. Then it was time to look around! 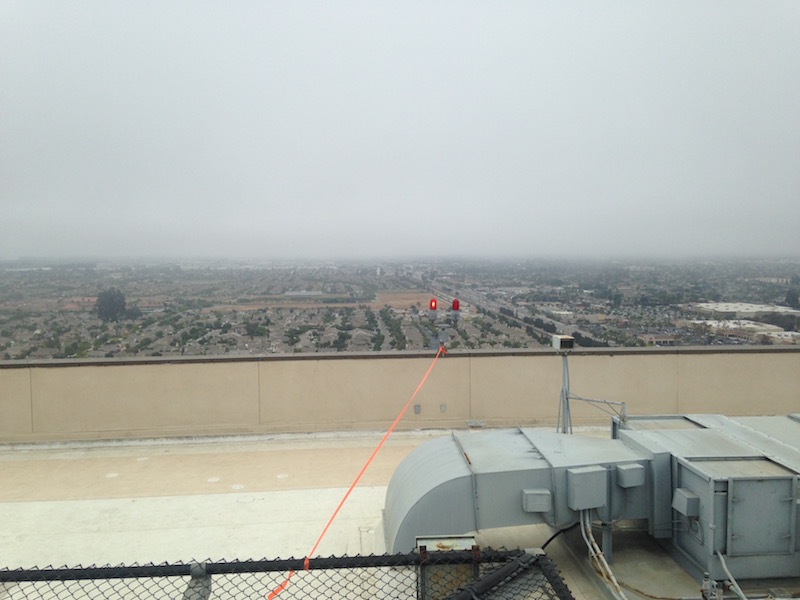 Being on high-rise rooftops is my favorite part about stair races, even when it’s a gloomy, overcast day. The Pacific Ocean is out there, I promise. I got a nice finisher’s medal, which I added to my collection. 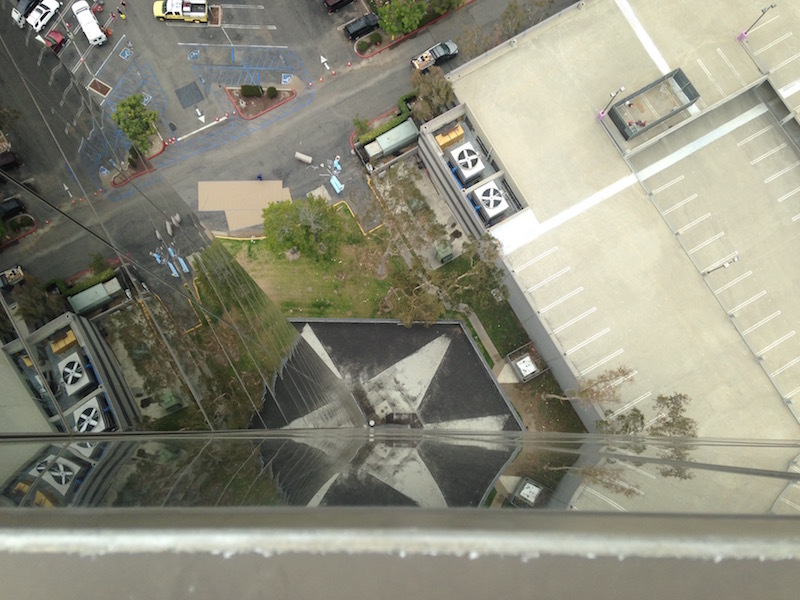 Many buildings are designed so the very edge of the roof isn’t easily accessible, but not Morgan Stanley Tower. 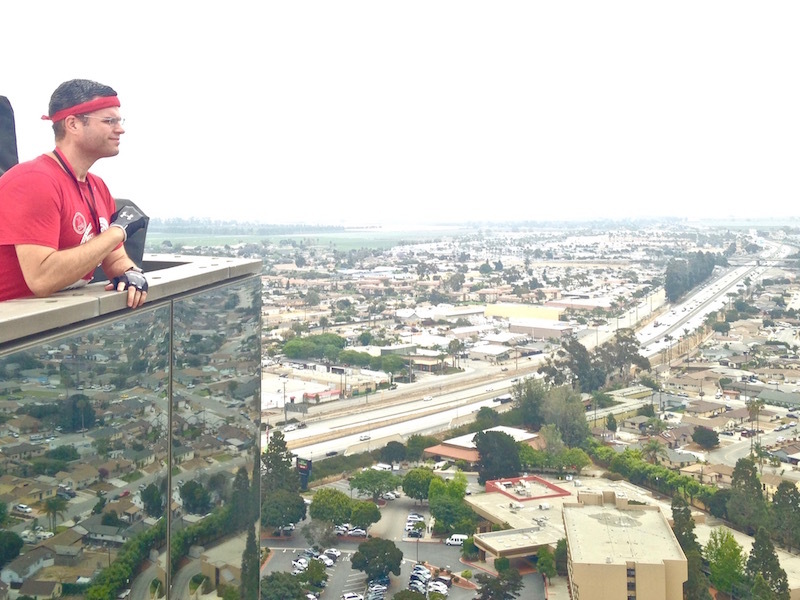 You could get right to the edge and look down. Plus, the shape of the building lent itself to one of my favorite rooftop photos EVER. My friend Paul owns a timing company, and he was handling the timing for this race, and he called out my time seconds after I crossed the line: 13:34. I had never done this race before and had no frame of reference, so no reason to be bummed about that time! Having done it once, I think I could shave some time off it next time, simply by not being a dumbass and pacing myself properly. 419 people competed in the event (with another 90 doing it without the obstacles), and of the 419, I finished 99th. Roughly the 75th percentile – not too shabby. 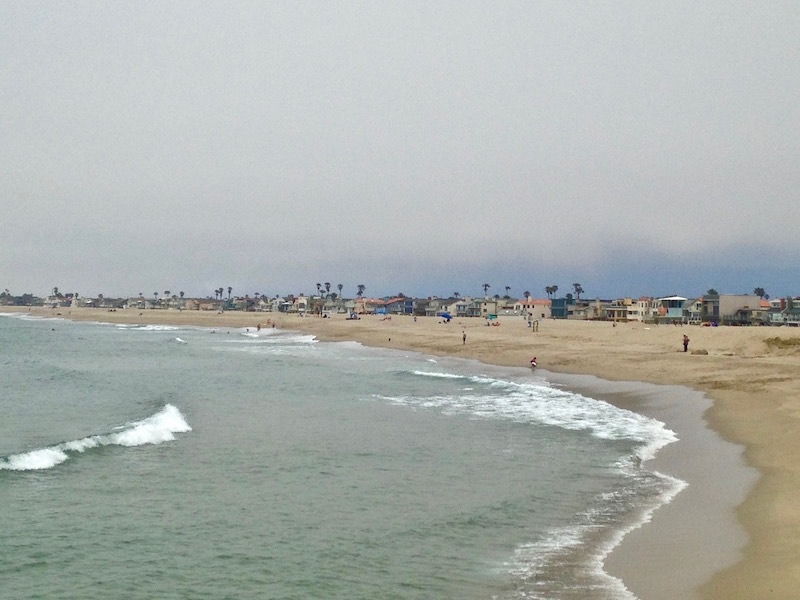 I had some extra time after the race, and I haven’t spent much time in Oxnard, despite it only being an hour from home, so I decided to head to the beach to go for a walk. I found a nice beach called Silver Strand, and walked around for an hour, covering 2.5 miles, much of it on sand. Walking on sand is fantastic exercise, because it engages more leg muscles, plus your core. If only the sun was out! This entry was posted on Tuesday, June 7th, 2016 at 12:19 am and is filed under Uncategorized. You can follow any responses to this entry through the RSS 2.0 feed. You can leave a response, or trackback from your own site. what an awesome view. you are doing more than most of us could do. keep it up David. Great stuff David!! Well done! !